Wednesday evening, April 10, 2019, Mack Fitzgerald peacefully left the world to begin his Heavenly journey. Born May 2, 1920 in Ben Hill County, Mack was 98 years...11 months…and 8 days old. 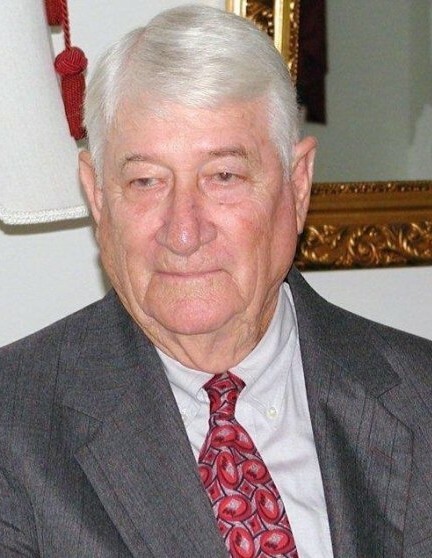 He will be lovingly remembered by his wife of 74 years, Deedy, and his daughters Anne F. Nelms (David), and Nancy F. Yeager (Barry) of Fitzgerald and Carol F. Stroberg (Chuck) of Dublin. Additionally, he leaves grandchildren, Dawn W. Parker, Leslie N. Drury (Darin), Paige N. Pruitt (Jason), Stan Walker (Heather), Brooke S. Hobbs (Tommy). Deedy S. Stroberg (Sloan), Anna Y. Lacey (Brett) and Eleanor Y. Roath (Kyle) to cherish his memory. This family patriarch is also grieved by several great grandchildren, cousins, a myriad of close friends whom he loved as family as well as many nieces and nephews including his brother’s children Wilbur Fitzgerald and Juliet Fitzgerald Sims. He was preceded in death by his parents, Tharp and Beatrice Fitzgerald, brothers, Wilbur Fitzgerald and Woodrow Fitzgerald, a son, Harry McKenzie Fitzgerald and a grandson, Charles Fitzgerald Stroberg. Mack was a proud patriot. During WWII he honorably served his country in the Army Air Corps as Flight Engineer and Turret Gunner on the B-24 in the 93rd bomb group. On a raid of the Ploesti oil fields in Romania on August 1, 1943, his plane was shot down and crash-landed. Mack’s quick response saved his life as well as lives of other crew members trapped in the plane. He was a POW in Romania from August 1943 till September 1944. Mack was later awarded the Purple Heart, Distinguished Unit Badge, Distinguished Flying Cross, European African Middle Eastern Theater Ribbon with 4 Bronze Stars, Air Medal and Prisoner of War Medal. To further demonstrate his love for his country and community, he spearheaded the placement of the American flags displayed on special holidays on Hwy 80 from downtown Dublin to the VA. Mack was a man of many talents. He loved woodworking, gardening, planning and creating projects of all kinds as well as dispensing wise words and sounds advice to all whom he loved. Services will be held at Townsend Funeral Home Chapel in Dublin Sunday, April 14, at 2:00 with visitation an hour before the service. A graveside service will follow at 4:30 in Evergreen Cemetery in Fitzgerald.